With over a decade of public speaking and presenting to C-level executives, Core Events brings you the right level of messaging about how Leadership and Service organizations can change client and partnership perceptions of you and your company. 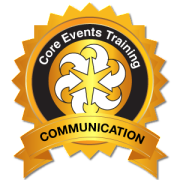 With expertise in presenting and speaking to multiple audiences, Core Events has gained its own training voice on how best to “Lead It 2 Win It” in developing a non-speaker to a professional and confident one. With our consortium of certified executive coaches and using learning’s from Toastmasters International, we teach clients how best to present their ideas or strategies to their leadership team, organization, and cusotmer base. Do you or your teams need to gain the confidence needed to connect with the audience? Do you need to acquire advanced skills on understanding body language, voice tone? Do you want to be a more competent and succinct communicator? Objective: The workshop is designed to give a rich learning experience on overcoming confidence blockers and building the focus to effectively communicate and connect with the audience. Participants will walk away with the ability to structure their speech or presentation and deliver it with high impact messaging. Learn how to build the right opening and closing statements. Structure of Workshop: This is a very hands-on workshop that begins with participants creating their own “Home Page” to talk about themselves and their type of profession. Once evaluation and critiqued is made, presentation techniques will be demonstrated and participants will advance to PowerPoint presentations to individual speech delivery. 2016 Session: “Lead IT 2 Win It:” Exposing the Speaker in You! Have you ever wondered how you view yourself as a presenter or speaker? Do you wonder what the audience see’s and thinks on how you speak to them? Do you or your teams need to raise the bar on their presentation and platform skills? Objective: Filming each participant this workshop always creates enthusiasm with our participants who leave our workshop ready for the chance to get in front of an audience. Primary objective is to learn how to demonstrate Leadership and Executive presence using body language, vocal variety and the assessment of the before and after of participant film clips. Structure of Workshop: From the beginning of the workshop we will film each participant to allow them to hear and see themselves as they are. The structure is very interactive with a “teach, learn and demonstrate” method that is proven to bring quality delivery to all. Contact us for more information and rate details.